As there is a possibility of heavy snowfall overnight, we wanted to remind parents/carers of our snow plan. Along with the Infant School and Nursery, we will make every effort to open in the event of snow. We will text all parents/carers to let you know of our intentions, as early as we can. Our website will be updated regularly, but in the first instance http://www.hants.gov.uk/schoolclosures provides details of all emergency closures. If there is significant snow, we cannot guarantee that pathways into school will be clear or safe so please take great care when walking on the school site. The Junior school gate leading on to the playground will remain locked during snowy weather. 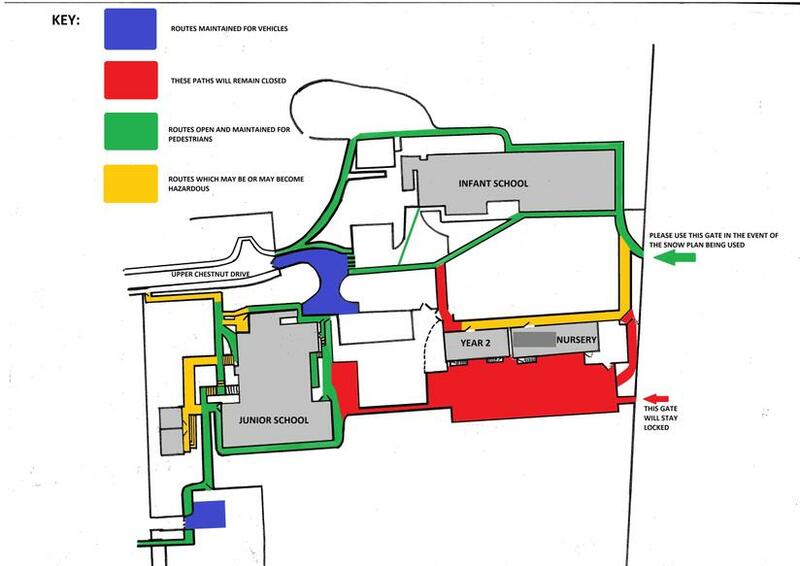 Entry to the Junior School will therefore be via the Infant School gate further up the hill on Kings Furlong Drive, or from Upper Chestnut Drive (see attached map). Please avoid driving whenever possible and in particular along Portacre Rise and Upper Chestnut Drive. Please use your own best judgement as to whether it is safe for you and your children to attempt to come to school. For your child’s comfort, please consider sending in a change of footwear/socks/tights. We do request that you still inform us, as usual, of any absences from school. In the event that there is bad weather during the school day, parents/carers will be informed by text message of their responsibility to collect their children promptly at the agreed time.